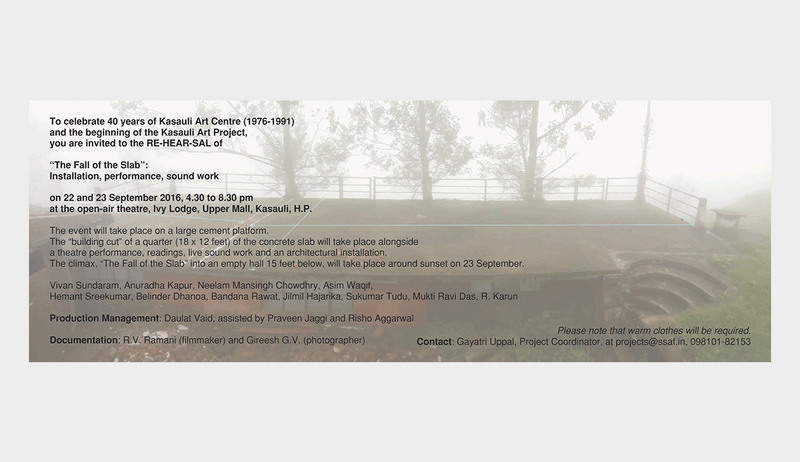 The Fall of the Slab was a two-day, multi-disciplinary art project conceptualized by Vivan Sundaram in September 2016, to commemorate the completion of forty years of the Kasauli Art Centre and to mark the beginning of the Kasauli Art Project. Conceived as an installation, performance and soundwork coming together on a single platform, the event centred on the demolition of a concrete slab (that had served as a stage for several activities of the Kasauli Art Centre) and brought together multiple practices to create an immersive live experience. Building up to the cutting and demolition of the slab/stage, an installation with bamboo poles that had been woven through the structure was extended and reinforced by Asim Waqif and his small team, adept at using this natural material commonly deployed in the construction of pandals for festivals. The ‘building cut’, a reference borrowed by Vivan Sundaram from Gordon Matta Clark for this project, was a neat incision made through the hard surface of a rectangular block of concrete by workmen. This was precariously held together on all four sides by means of a manually operated pulley system, to be lowered to the ground below. The tone of the tableau was of a work in progress with many converging layers. With an inventive title, ‘ReHEARsal’, this included an improvised performance in a repetitive drill by four actors under the direction of Anuradha Kapur and Neelam Man Singh Chowdhury. At the same time, enveloping this was Hemant Sreekumar’s live sonic work, textured and complemented by the immediate environs and acoustic guitar played by Karun Ramani. By throwing the spotlight on these actions, a sense of magnification of different acts of labour and performance came through. The evening culminated with ‘the fall of the slab’, a spectacle with the audience being cautioned about the possible risks of the yet-to-drop concrete slab. This sensory experience built up a high-intensity atmosphere and a heightened sense of urgency. Spectators and performers in masks and safety-goggles stood by in both anticipation and trepidation of the final moment. The slab fell, a rough and heavy drop, ripping through the slim bamboo poles arranged in a delicate geometric pattern. It opened up a window to a blue night sky, and then there was riveting silence. The serenity that followed the destruction and intense experience was used as an occasion to reflect on the history of the Kasauli Art Centre through a projection of archival photographs.